What does a Magnetic Starter do? What do I need for my machine? I Have This Old Starter I Scrounged Up , Can I use it? Plan to buy a used NEMA style unit. A-B 509 and 709 are good choices, as is the Square D 8536. Furnas, Westinghouse, GE are also popular. With other brands, or more obscure models, you are less apt to find the heaters you will need. Consult a NEMA table to figure out what size starter your motor needs. This is based SOLELY on phase, voltage, and HP. Buy a used NEMA style magnetic starter in that size. Don’t worry what size or how many heaters it has, if any. Also make sure the coil voltage on it is a voltage that you will have available in the enclosure it will go into. 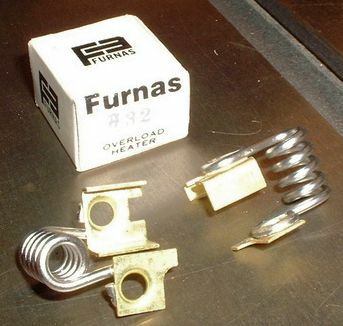 Consult the appropriate heater table to find the right size of heater you need for your model of starter, given your motor’s fully loaded Amps (FLA). Heaters from the major brands are still readily available used. If your unit didn’t come with pushbuttons or an enclosure, you’ll need to buy them too. Go read the Starter Wiring wiki. contactor – blue. 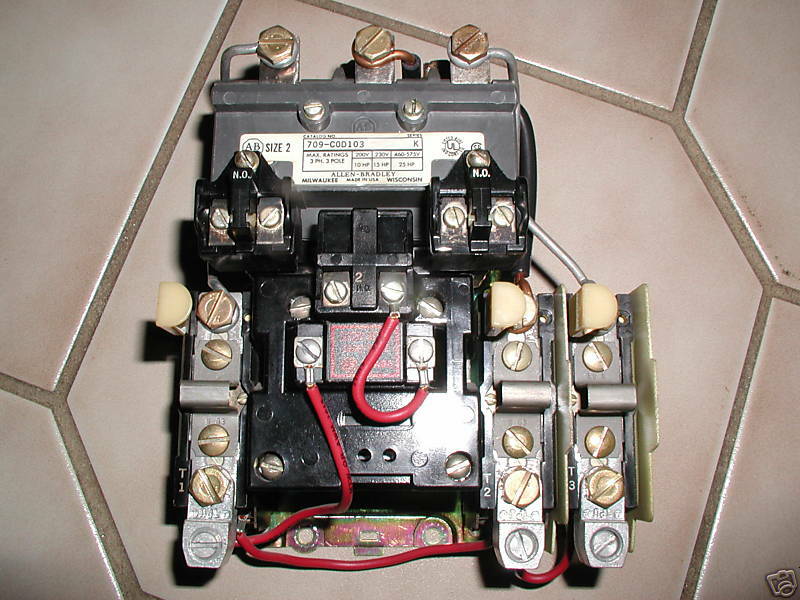 The bottom of the contactor is partly covered up by the pushbuttons. heaters – red. Two are on one side, one on the other. Other manufacturers’ heaters are in line with the contactor rather than to the side. pushbuttons – yellow. This unit is screwed onto the contactor. The actual pushbuttons are not visible in this photo, and are mounted on the front of the enclosure. They push against the two round nubs shown in the photo. You probably wound up here because you need to buy “something” to turn on the motor on your machine, or perhaps you have bought or scrounged a used “something” and realize that you have no idea if it’ll do the job, or maybe you are changing your machine to use a new motor with a different voltage/phase and are not sure if the existing “something” can do the job. I recently went through the same experience. I bought a new motor with different voltage, phase, and HP specs from the original in my planer, and wound up spending more on a new Magnetic Starter than the motor cost me! That was a rude shock. Second time around I got a bit smarter, understanding more of what I needed, I was able to get what I needed used off eBay for way cheaper. OWWM wisdom is that setting up the Starter, running the wiring, and spec’ing and mounting the motor can often be a bigger chore than restoring the machine itself! Let me first state that I am by no means an expert on magnetic starters. Having just recently gone through the experience that you are in the midst of, I hope that by laying out what I learned along the way your path the understanding what you need will be smoother (and cheaper!) than mine was. I hope that this wiki will serve as a starting point that others with more expertise in the area will add to. If you find any errors or missing information in this wiki, please feel free to make any changes you feel are needed! First, we need to settle on some definitions before we dive into the details. A lot of people play fast and loose with the terminology of starters. A ubiquitous electrical component that typically consists of a coil and one or more sets of contacts. Normally a lower voltage/current is applied to the coil, closing (turning on) a higher voltage/current circuit through the contacts. Your car is full of relays, so is your washing machine. Any time you hear an electrical device make a ‘click’, that’s probably a relay. The main component of a Magnetic Starter is a big relay called a Contactor, which is controlled by a set of momentary contacts in the form of a control station (Start/Stop). A contactor will often be fitted with auxiliary relay contacts as well. One set of tehse will be used to latch the contactor in the ON position after pressing the On button on the control station. These auxiliary contacts, available in both Normally Open (NO) and Normally Closed (NC) can also be used to control other equipment such as a dust collections system, lights, etc. A separate item from the Magnetic Starter. Normally a big box with a handle on the side that completely disconnects (hence the name . . .) a circuit from the power. Apparently required by some electrical codes in addition to the breaker box on your wall and the starter on your machine. Completely unrelated to turning your running machine on and off, and despite their impressive heft, in fact they are not designed to do so and will not last long if used for this purpose. You will need a disconnect if your machine is hard wired to the building wiring. This disconnect is a safety to ensure that the machine cannot be turned on when working on it. If your machine is equipped with a plug that you have to plug into a receptacle, this is your disconnect. Disconnect your machine whenever working on it, changing blades, etc. A magnetic starter WILL start the motor regardless of where your hands are if the Disconnect is not used! The power in your shop will be either single phase or three phase, usually single phase unless you are in an industrial location. Your motor may require single or three phase. (Creating three phase from single phase is way beyond the scope of this wiki, and will not be covered here.) Motor Starters are normally designed for three phase operation, a few are designed for single phase operation. Three phase Starters can be used in single phase applications, but the converse is not normally true. If you have a single phase motor, you don’t need to get specifically a single phase Starter. The selection of three phase starters is way larger, and wiring them up for single phase is trivial, so go ahead and get a three phase Starter. Note that there is some controversy in the forums regarding how many heaters are needed when using a three phase starter in a single phase application. Some feel that only one (the hot) leg needs a heater, others feel both should have one. Some starters may require all three heaters be in place to function, while the rating and thus proper operation of the heaters may be predicated on all three being present. So bottom line is that heaters are cheap. Use three even if you are single phase and you’ll never have to worry. The heaters being in close proximity with each other are going to affect the trip points. If one has no current flowing through it, it will not be heated and may affect the trip point of the other two. AB always indicates that three heaters still be used in a single phase application. For the 509's, you have to have the position occupied anyways, you might as well wire through it as they indicate. This is what you use to turn on the lights in your shop. The word “switch” is best not used to describe the Starter that turns on your machine. Get that word out of your head right now! It’ll just cause confusion for you. That’s the first thing a newbie should learn, and I will confess without shame that I used the term “switch” in my first post on the subject in the forums. However, if you have a fractional horsepower motor, up to 1 HP or maybe 1.5 HP, then you can probably get away with a sturdy double pole, single throw 30 amp minimum switch. Ideally, the switch will be designed for starting a motor as these switches are designed to reduce or eliminate the arcing that inevitably occurs when starting an inductive (motor) load as opposed to a resistive (lights, etc.) load. Be aware that most toggle type switches offers no overload protection and none will offer automatic shutdown in the event of power loss. Some manual motor starting switches are available with heaters. If you use a switch for a motor running at 220VAC or greater (i.e. both leads to the motor are hot), it must be of a two pole type. A single pole type is only for use at 120VAC and the switch must break the hot lead (usually a black wire), not the neutral (usually a white wire). A manual motor starter may be equipped with pushbuttons, a toggle or even a rotary switch mechanism. These starters require mechanical action (you pushing the start or stop button) to close or open the contacts on the starter's contactor. Manual starters may contain "heaters" which are overload protection devices that will automatically (by mechanical means) open the contacts in the event that the motor draws too much current. The heaters must be sized for the full load operating current of the motor for the voltage that you are operating the motor at. Manual motor starters equipped with overload protection will include a reset of some sort. Often, switching the switch to the off position will reset the thermal overload. Sometimes the reset is combined with the stop button. Except for a shut down due to the tripping of a heater, manual starter will remain on if you have a power failure. This means that when the power comes back the motor will start automatically, making them inappropriate from a safety perspective for any machinery where this is an undesirable situation. If you do have a power loss with a machine equipped with a manual starter, you must remember to turn it off immediately. A magnetic starter is similar to a manual starter except that it uses a relay to connect the contacts. 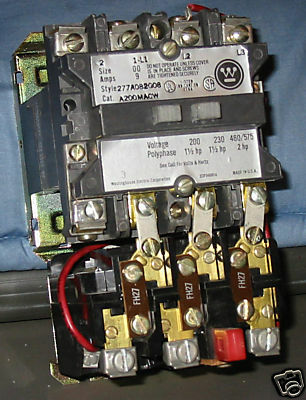 The control station that controls this relay are usually low current momentary contact switches. Pushing the start button energizes the relay and starts the motor. There is a "holding" contact on the relay which keeps it energized until something else interrupts the current to the relay such as pushing the stop button or if there is a power failure. You have to press the start button again after a power failure to start the motor. Magnetic starters usually have heaters which function as described in manual starters above. These heaters may self reset or they may require manual intervention to reset after being tripped. A Magnetic Starter consists of a contactor, heaters, coil, control station pushbuttons, and an enclosure. The control station pushbuttons may or may not be in the same enclosure, and some or all of the starters components may be integrated together. Sometimes it’s just called a Starter, or a Motor Starter, or a Magnetic Motor Starter. It is NEVER called a Switch. While we are on the subject, the above assumes that the control station is wired as a "three wire" control. 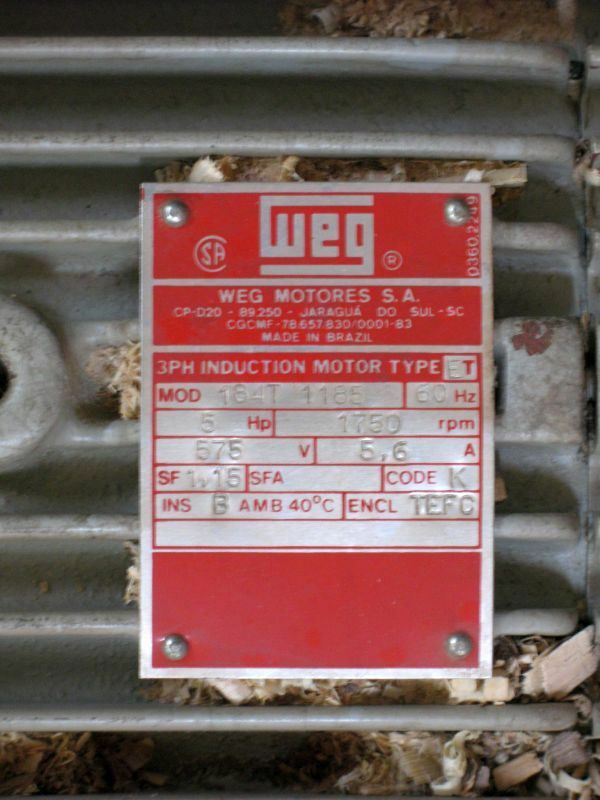 This is typical and is what is shown on the Wiring Wiki but Magnetic Starters can be controlled in other ways, some of which DO NOT provide the No-Restart safety feature. If you are looking at an unknown piece of equipment, it is best to verify this before relying on it. Be Safe, Not Sorry! This is the heart of the Magnetic Starter. I like to think of it as a hopped-up relay. It’s the part that closes the circuit to your motor, allowing current to flow and the motor to run. It has a set of contacts for controlling the power to the motor, normally three, sometimes two. It also has a coil that when energized by the control circuit will cause the motor contacts to close. 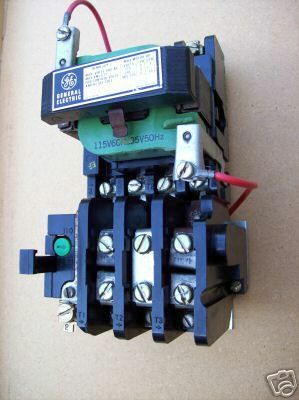 Sometimes the contactor is incorrectly referred to as a Starter. It is only one component of a starter. This misleading description is common on eBay. 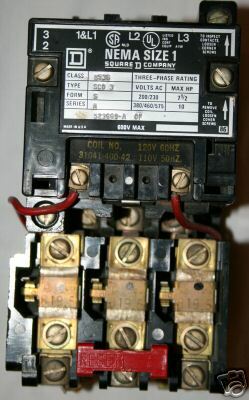 Note that NEMA contactors frequently have their “ratings” printed on them in addition to their size. This is unnecessary, since the NEMA size will fix the ratings of the contactor. Thus, the printed ratings are redundant, and simply taken from standard NEMA tables for that size. Also called Thermal Overloads, Thermal Overload Relays, Overload Heaters, or simply Overloads. These are basically simple current sensitive circuit breakers that are matched to the current draw of the motor, and plug into or otherwise attach to the contactor. They will trip if their temperature rises above a certain level, due to excessive current passing through them. Heaters sense current, not voltage. Once tripped, current to the contactors coil is interrupted which causes the primary motor contacts to open and the motor to stop. Note that if the heaters trip, both the control circuit and the motor circuit are tripped or disconnected. Some thermal overloads will automatically reset after cooling, while others require a manual reset. The fact that the control circuit was interrupted will ensure that the relay is not re-energized, and the motor will not restart, after the heater is reset. They may seem redundant, after all you have a circuit breaker box in your house/shop that protects everything, so why do you need another? The reason is the circuit breakers in your house are designed to protect the wiring in your house, and by extension the house itself. The heaters in your Magnetic Starter are designed to protect your motor. Heaters are designed to mimic the characteristics of a motor in use and have similar heating characteristics. Motors can tolerate short term overloads without damage. These overload conditions can persist far longer than a typical circuit breaker or fuse can tolerate at a similar condition, that’s why we use heaters instead of a similarly sized fuse or circuit breaker. You want your heater to trip the overload before you smoke the motor! 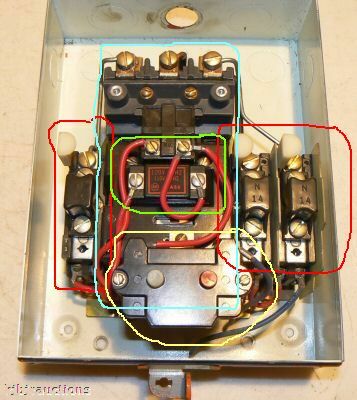 eBay listings frequently describe contactor/heater combinations as starters, which is not completely true, as they are only part (granted a major part) of a full starter. Keep in mind that purchasing a suitable case for your contactor can cost more than the contactor itself. Heater sizing is interesting, they are not specified in Amperes like fuses or household circuit breakers are. Rather, each manufacturer has one or more “series” of heaters. 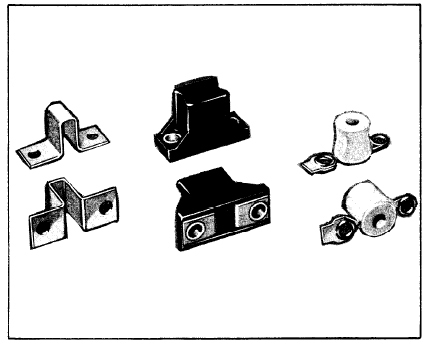 Each series is typically used in conjunction with multiple models and sizes of contactors. Each heater has a number, e.g. N-38, and you must use a table supplied by the manufacturer to determine the correct heater for your motor, based on the motor’s current and the contactor’s NEMA size. For example, the N-38 heater is rated at 23.6 Amps with a NEMA size 3 contactor, but only 19.1 Amps with a NEMA size 1 contactor. Also, different series within a single manufacturer have different ratings for the same numbered heaters. For example, an A-B N38 has a different rating that an A-B W38. Different tables are used for heaters in an open starter vs one in an enclosure. Even the type of enclosure can have an effect. Some heaters are relatively common and easy to find, while others are obsolete and may be very difficult to obtain. Be aware of this BEFORE purchasing a used starter. Here are a couple examples of common heaters. This is the circuitry that supplies power to the coil in the contactor to close the circuit to the motor (turn the motor on), and removes power from the coil to open the circuit to the motor (turn the motor off). A set of auxiliary contacts on the main Contactor are wired to keep the Coil energized until interrupted by the STOP button. Note that the auxiliary circuit normally uses only a small amount of current, thus requiring small wires. 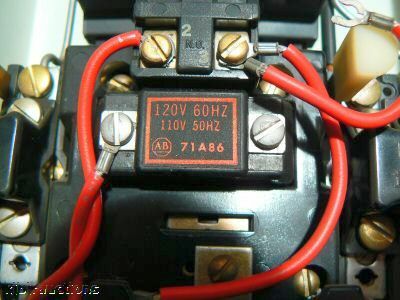 Be aware that coils are available in several different voltages (24v, 120v, 208v, 240v, 440v, 575v, etc.). You will need to provide the appropriate voltage to run your coil or the starter will be of no use. Most coils are replaceable, but they can be hard to locate and expensive. Coil voltages lower than your supply voltage are easily created with a step-down transformer, but coil voltages higher than your supply voltage are more difficult to generate. 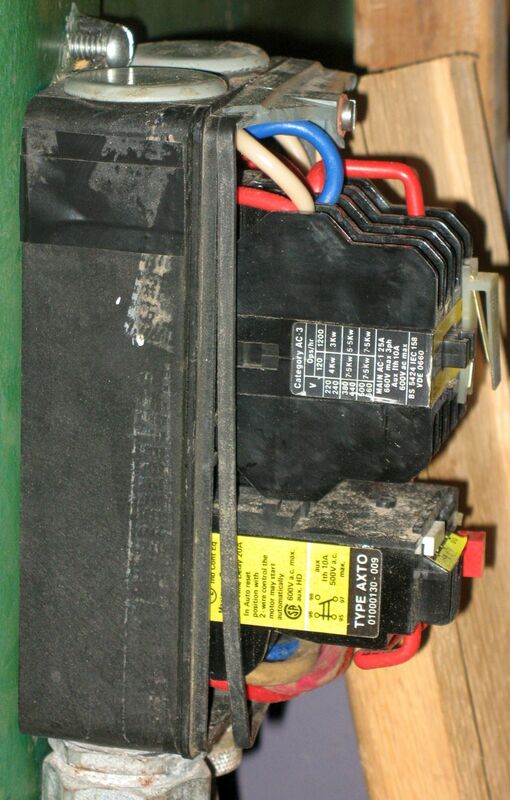 Transformers are also an added expense, slightly complicate the wiring and take up valuable space in, or on, the starter. The advantage of using low voltage control is evident when using many control stations, at the blast gates of a dust collection system for example. Furnas LVC starters have an integral step-down transformer allowing them to be used in many different voltage applications. A Normally Open pushbutton (such as the ON in our Magnetic Starter) would normally not allow current to flow through it (i.e. it’s “open”), and would allow current to flow only so long as it was pressed. A normally closed button is the opposite. The Pushbuttons may be mounted in the same enclosure as the Contactor and Heaters, or may be mounted remotely. In that case they can be more correctly called a “remote control for a mag starter” or sometimes a “pushbutton station”. In industrial applications there may be pushbutton stations in several locations. Note that the pushbuttons do not carry the full load of the motor’s current. So they are electrically speaking quite light duty devices. You have wide latitude in selecting the pushbuttons for your system, as long as they were designed for the coil voltage you will use, you should be good to go. The coil is a key component of a Magnetic Starter. Electrically, it is part of the Control Circuit, in fact it is what the control circuit controls. Physically, it is located in the contactor. Contactors are rarely ever sold without a coil in them. 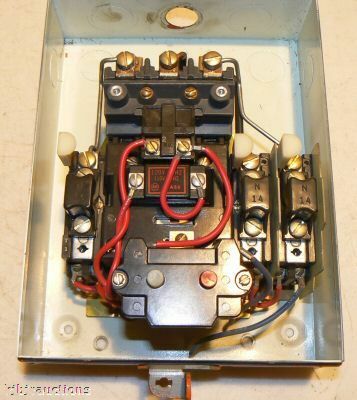 When you push the “ON” button, the contactor’s coil is energized, causing the contacts in the contactor to close. At the same time a separate set of auxiliary contacts is also closed. This set of contacts is usually wired to keep the coil energized and thus the main contacts closed even after the Start/On button is released. Similarly, when you push the “OFF” button, the auxiliary contact circuit is interrupted and the coil is de-energized opening the main contacts. The key thing to understand is that a coil is rated at a specific voltage. So when you buy your starter, make sure the coil has the right voltage for your application. Usually “the right voltage” means the same voltage as the motor. One exception might be in a 240V situation, if the neutral line is also brought into the enclosure, then 120V will be available so either a 240V or 120V coil would work. (Never use ground in place of neutral.) Another exception would be if the pushbuttons are to be really remote from the rest of the Starter, 24V might be a safer choice. Coil voltage is particularly important if you are dropping a new starter into an existing pre-wired enclosure. If your coil is rated at a voltage that you don’t have in the enclosure you’re either running a new cable to the enclosure, fiddling around with a transformer, trying to dig up a suitable coil, or buying a whole new starter. These scenarios are easy to avoid with a correctly rated coil. Coils can normally be replaced with one of a different voltage rating, but replacement coils are not nearly as widely available as heaters. National Electrical Manufacturer’s Association. Years ago they defined a set of standards for Magnetic Starters, in particular contactors. The standards are pretty simple to understand, and widely used in the US and Canada. NEMA Contactors are designed to be specified based on phase, voltage and horsepower. They are sufficiently overbuilt to handle a wide variety of applications. NEMA Heaters are spec’ed based on the full load current of the motor. You figure out the size contactor you need based on phase, voltage and HP, then figure out the size heater you need for the contactor you have chosen based on the full load current. All NEMA contactors of the same size have the same ratings, regardless of what may (or may not) be printed on them. International Electrotechnical Commission. The IEC has also defined a set of standards for, amongst other devices, electric motor starters. IEC rated devices are very common in Europe and Asia and are becoming more prevalent in North America, especially on imported machinery. IEC starters are also available with many features not available on NEMA starters. They are often smaller than comparable NEMA starters and DIN rail compatible making them good candidates for automation control systems. IEC spec starters may not have discrete heaters, but rather use adjustable current blocks. These function in exactly the same manner as a discrete heater with the added advantage that the current rating can be adjusted within the specified range of the device rather than having to obtain new heater elements. Unfortunately, the specified range of the device is usually fairly small. A very good explanation of the differences between IEC and NEMA can be found here. Many OWWM’ers prefer the more robust NEMA style, and think they look more appropriate on the older machines. However, new NEMA starters are not cheap, but they are more plentiful on the surplus market. High quality IEC starters are also available at often very high prices. While there does not seem to be as many IEC starters on the surplus market, there are many low quality IEC Starters on the market at a very appealing prices. As with anything, a low initial price may not be a cheaper alternative in the long run. There are several important tasks that the Magnetic Starter performs. Obviously, it safely starts up the machine. And, it does this is such a way that it minimizes arcing of the contacts, and danger to the operator. A ‘switch’ as we commonly know it would be destroyed quickly by the arcing caused by the high start up currents of larger motors. To minimize arcing a starter uses a low current control circuit to turn the contactor on quickly, and also the physical area of the contacts is large, further reducing arcing. If the starter (manual or magnetic) is equipped with thermal overloads or heaters, it will also provide a line of defense intended to protect your motor from drawing too much current. In the case of a high current draw, the heaters will break the circuit and shut the motor off, hopefully before any damage has been done. Another advantage is that the control stations may be mounted remotely from the starter itself. In addition, a single starter may have more than one control station allowing emergency stops, for example, to be located at several different positions. This is really why you are here isn’t it? So, having read all the background info, what do YOU think you need?? If you answered “a properly sized contactor, properly sized heaters, a coil with the correct voltage rating, pushbuttons, and an enclosure”, you would be right! Let’s look at a couple ways to get what we need, going with a new IEC starter, or going with a used NEMA starter. you could go with a new NEMA starter as well, but that is a less popular choice with OWWM'ers, as you can get the same thing used for way less on ebay, plus you get the period looks as well. 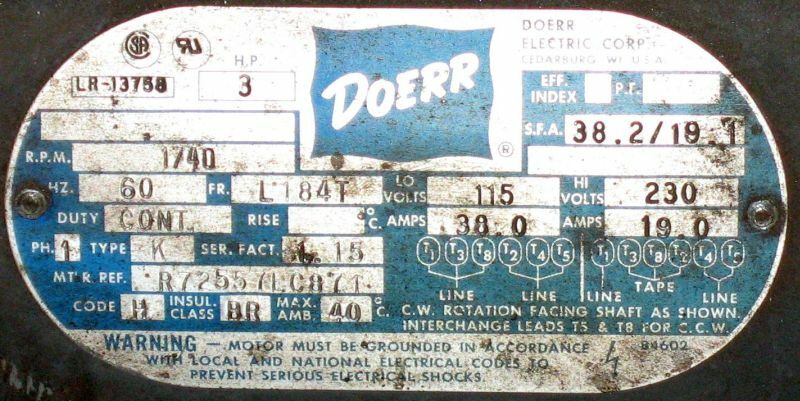 The first thing to do is to look at your motor plate and note the phase, voltage, horsepower, and the fully loaded current draw (FLA). Let’s say for example that you have a 230V 3 HP single phase motor that draws 19.0 Amps fully loaded, such as the one in the photo below. If purchasing new, these will likely be IEC units. IEC units are available with different coil voltages and current ranges. Pick one suitable for the motor you wish to control. If you look around, you may be able to find a used NEMA starter for the same money. There are several steps you need to take in the process of finding the right starter for your situation. Be aware that, as with anything bought used, there is the chance that it might not work or might be incorrect for your application. In that case, unless the buyer offers returns, then you will be out of luck. That being said, these old contactors are well built and the biggest problem typically is the contacts can wear due to arcing, and are thus in need of polishing or rarely, replacement. Be aware, it may be very difficult to locate parts to rebuild or repurpose an old, obsolete NEMA starter. NEMA starters (actually just the contactors) are selected based on phase, voltage and HP only. You can use NEMA tables to help you decide what you need. For three phase, select the “Full Voltage Starting” column. So, if you are wanting to run the example 240V 3 HP single phase motor, you can see that the NEMA 1 sized starter is rated for 3 HP in 240V single phase scenarios. It’s as easy as that. Any NEMA size 1 starter from any manufacturer will do. FLA does not matter, any current rating or other mumbo jumbo printed on the unit does not matter. There are several suppliers who specialize in the older NEMA style starters. There are other suppliers mentioned in the forums as well, these ones came to hand as this wiki was being written. Southland Electrical has received many favorable reviews on the forums. Power Equipment Sales Company, and Mag-trol (ask for Lars), CPI Surplus and Automation Direct are also popular suppliers. They can probably find a complete NEMA unit to meet your requirements. Alternatively, eBay is a great place to buy what you need. It’ll take a little more work, but it can be much more economical, and you’ll learn a lot. Search for Magnetic starter, motor starter, NEMA 1, etc. You will quickly notice that your eBay searches will turn up a wide variety of sizes, ages, and styles (IEC/NEMA) of units. As one OWWM’er put it “the dizzying array of manufacturers and models is, well, dizzying”. Some units will be more complete than others, as will the information and photographs provided by the seller. It is unlikely that you will find a complete unit with the correct size heaters for your application. That’s OK, heaters are cheap and readily available for many starters. It is more important that you select a proper NEMA size (in our example’s case, NEMA 1) and with a suitable coil voltage for your application. You will also notice that some manufacturers’ devices are more widely available than others. In particular Allen-Bradley 509 and 709 and Square D 8536 are easy to find, and to a slightly lesser extent Furnas ESP 100, GE and Westinghouse. The A-B 509 is a more modern unit (80’s? ), the 709’s are older. The A-B 500 series (“Bulletin 509 Starters” in the A-B nomenclature) numbering system is explained here. The Model number will give you an indication of how the starter was supplied from the factory, but many parts can get changed, added, removed, etc. over time. Note that many starters which were originally supplied with enclosures are offered for sale after being removed from the enclosure. Also notice that NEMA specifies enclosure “type” as well as contactor size, but the type is generally not important to OWWM’ers. It hasn't been too many years back that 3 phase magnetic starters used only two heaters. If the motor was overloaded the two heaters opened and the starter clicked off. 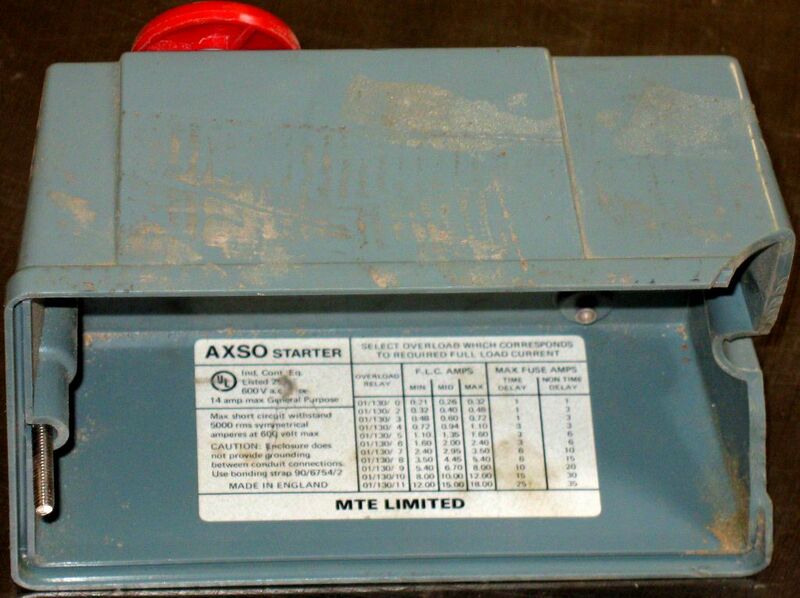 Now three phase magnetic starters use three heaters, but you may come across some units configured in this older style. So here is a starter that might be suitable for our example motor. It’s a NEMA size 1 with three N-14 heaters and a 120V coil. 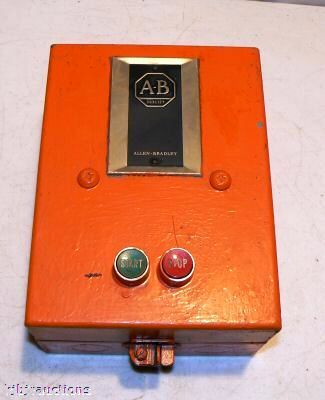 It also includes the control station pushbutton, and an enclosure. This is nice because it includes everything we need, except that the heaters are the wrong size, and the paint is not to everyone’s tastes. That’s OK, heaters are cheap and readily available. 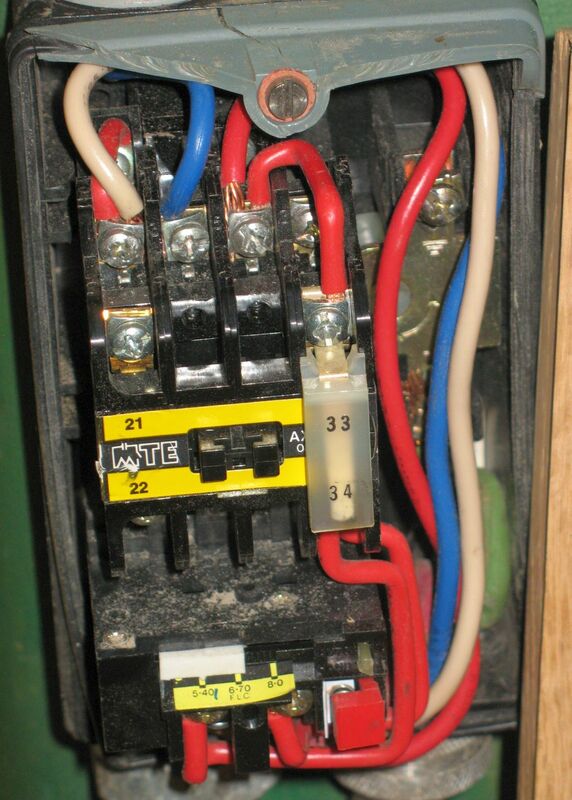 Notice that the heaters kind of hang off the side of the contactor. This is one configuration, but the heaters may also be located below the contactor, or even remote from the body. To choose heaters you need to know what contactor you will be using. In this example, it’s an A-B 709 series. You can see from looking at the pictures that it comes with N-14 heaters. We can consult a heater table such as the one here for the A-B “N” series to determine that the N-14 heater in a NEMA 1 starter are rated for only 1.98 Amps. Clearly this is inadequate for the 19 Amp motor! The same table shows that for 19 Amps an N-38 heater will be required. A search on eBay shows heaters available from numerous suppliers for under $3 each. So our work is done here. Time to consult the Motor Starter Wiring Wiki. Unless it is one of the popular models that has a wide variety of heaters available for it, it is unlikely you will be able to use it. Even if the contactor happens to be a suitable size, you will have a very difficult time finding the heaters you need. But, assuming you have a popular brand, what is its NEMA size? It’s pretty easy to tell with the older NEMA units. Look at the contactor of the unit you want to use – the NEMA size will be printed right on it. Then use the NEMA table referenced at the top of this wiki to determine what NEMA size your motor requires. So. Is the starter you dug up the right size for your motor? Recall our example motor requires a NEMA 1 unit. If you are holding a smaller unit such as NEMA 0 or NEMA 00, then the answer is No you can’t use it. What about if you are holding a bigger device, such as a NEMA size2? Normally you would not use a larger NEMA size than you need since they are generally more expensive than the smaller ones. However, if you already have it, you still may be able to use it as long as it’ll support the right size heaters. So if we think back to our example motor of 19 Amps which needed the N-38 heater in the NEMA size 1 enclosure, by consulting the A-B heater tables again, we can see that for a NEMA size 2 contactor, we will require an N-37 heater. Not dramatically different in this case, the problem really lies at the lower current levels, where a NEMA size 2 contactor will not operate at all under 5.3 Amps. Unless you are remarkably lucky, the heaters that came with the starter you scrounged up will probably not be the right size. Whether it came with heaters or not doesn’t really matter, you should expect to have to buy the right size ones. What about the coil, is it a voltage that you can supply? If it’s a 440V coil you are looking at some extra work/cost that can be easily avoided by using a different coil or a unit with a different coil. Luckily, many used starters for sale will come with 240V or 120V coils. If you receive one with a 24V coil, you will need to use a suitable transformer to obtain 24V for the controls. Don’t forget you’ll need a control stations (pushbuttons) and an enclosure too! This motor came from a jointer. It’s a 575V 3 phase 5 HP motor that draws a maximum of 5.6 Amps. The unit is an IEC starter of unknown age, made in England (really!) by a no longer extant company called MTE, perhaps it’s 80’s vintage? It’s IEC category AC-3 which is the appropriate category for most woodworking applications. This does not relate in ANY way at all to NEMA size 3. It is rated for a max of 4Kw at 240V. Our motor is 3 HP, which converts to 2.24 Kw, so at first blush things look OK. The overload on it is a 01000130-009. But, looking at the table that is on the inside of the starter enclosure, we can see that this overload is spec’ed to a range of 5.4 – 8.0 Amps. That is insufficient for our 19 Amp motor. In fact, the table seems to indicate that the largest overload suitable for this contactor can only handle 18A. Since this is such an obscure starter, we have no way of determining if larger overloads were made for it. And none are available on eBay or anywhere. So this unit cannot be used with our 3 HP 240V motor. 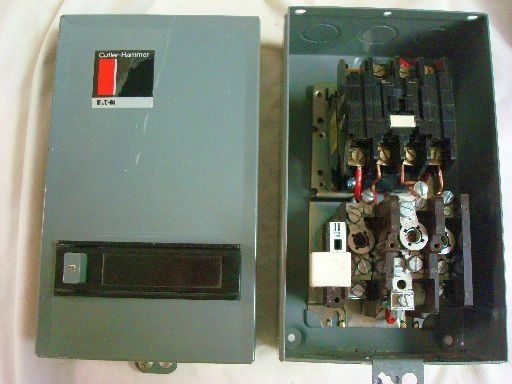 In addition, the contactor is wired for 575V control, so even if the contactor and overload were suitable for the current of the 240V motor, the coil voltage makes it unsuitable for this application. A transformer could be used to step up from 240V to 575V, but you will note that there is no space in the enclosure for a transformer. A couple of interesting notes on this device. Its compact size is typical of IEC starters, everything is in a single enclosure that is small by NEMA standards. Note also that the contactor’s power rating actually increases as the voltage goes up. The interesting flip side of this of course is that when changing a motor out to a smaller one that runs on lower voltage, often the contactor will not be able to handle the lower voltage and horsepower! This is true of NEMA starters as well. Lastly notice that the overload actually has a small white slider on it that will allow the overload current to be set quite precisely anywhere in its range or 5.4 to 8 Amps. Here’s another AB unit. It’s a NEMA size 2 and has what look like three N-33 heaters on it. Can’t tell from the photo what the coil voltage is, the red printing that is obscured by the camera flash would normally show it, but red printing on an AB starter means a 120V coil (208v is black, 240v is green). Also, there is no control station or enclosure with this unit. These would have to be sourced separately. Here is a Westinghouse NEMA size 0 unit. It has three FH27 heaters on it. Notice that they are positioned directly below the contactor like an AB 509 rather than to the side as are the AB 709 heaters. It does not have the coil voltage printed on it, but the vendor helpfully states “I assume that the coil is 230 Volt because that was the voltage it was hooked up to”. Remember, Caveat Emptor - Buyer Beware. There is no guarantee that this coil is 230 volt. Here is a photo of a Cutler Hammer starter. This is a more complete unit, with the housing and pushbuttons, and there does appear to be a separate heater block below the contactor. Otherwise, it’s hard to get much info from the picture. 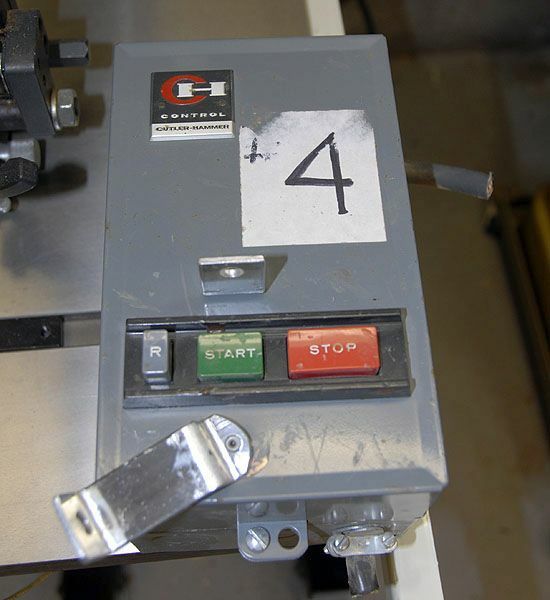 The vendor states “A Used CUTLER-HAMMER CH Motor Starter With Enclosure... VERY Heavy Duty... 600VAC... Coil Voltage Is 208V 60HZ... 3 Thermal Protector Heaters # 1026... Heaters Are Rated From 2.73 To 3.04 Amps... 3 Heaters With Reset.” He does not state what NEMA size it is. The small heaters could indicate that it was originally used at about 3hp if the voltage was 575v, or about 1hp at 240v. 208 volt is a three phase (3ph) Wye specific voltage. Although it is not recommended, this coil will function with single phase 240 volt supply, albeit you may shorten it's life. Here is a GE starter. This one is interesting because it only includes two heaters, the place where the third heater would normally go is simply shorted. Vendor states it is NEMA size 1, has a 120V coil, and gives the heater size. Possibly used in a 120V single phase application where only a single heater (two heaters optional) are required. Again, the control station and enclosure are not included. Here is a Square D starter. It is a NEMA 1 with 120V coil. Can’t tell exactly what size the heaters are, might be S19.5, but new and correct sized Square D heaters are easily obtained. Here is a more modern Cutler Hammer starter. It shows clearly on it that it is NEMA size 00. It has three heaters which may be set to one of four current settings. Kind of a transitional type of heater between the single value heaters of old, and the potentiometer adjustable heaters on today’s starters. The "Class" of a heater designates the trip behavior in terms of the time constant. Class 10 will trip in 10 seconds at 600 percent of its rating. Class 20 is 20 seconds, class 30 is 30 seconds. This designates one point on the curve but it also determines the overall shape of the trip curve. General purpose overloads are usually Class 20. In the A-B world (Bulletin 509 starters), this would be a Type W. If you want Class 30, you would sub a Type WL. For Class 10, you would use a Type J. Class 10 overloads are usually used for hermetic motors that cannot stand a high degree of overload. Class 30 are used for high inertia loads. A big direct drive band saw may actually fall in to a Class 30 designation. One can start with class 20 for general needs. If the machine trips at startup, with properly sized heaters for the motor, then look at class 30's. This is preferable to up-sizing the heater to accommodate a hard start. There is some scuttlebutt on the forums that A-B’s type W and N heaters do offer a degree of interchangeability, easily in one direction and with modifications in the other. 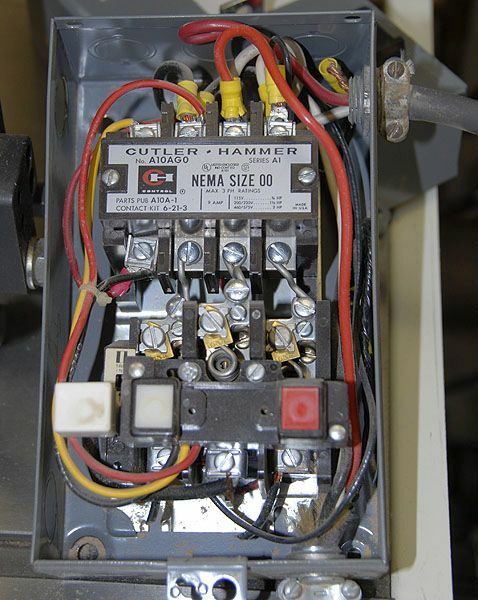 While NEMA size refers to the electrical “size” of the contactor as described in the previously referenced NEMA tables, NEMA style refers to the size of enclosures used to house Starters.